Posted: Thu Oct 13, 2016 9:42 am Post subject: THANK YOU ALL! And "Thanks!" to all of those here who have been so kind with their comments and contributions. To connect with so many talented people, and hear from those like Tom Southwell who actually worked on the film and has been so generous with his answers and images, is AMAZING! An amazing collection. I'd love to see a full set of prints for sale. So fantastic, my man cave yearns for these! Replicant 13...and not one of your post was boring Great covers, research and yes, Tom Southwell was a trove of info that only somebody like him could've shared To the next 5 years and into BR 2049. Posted: Tue Oct 18, 2016 10:57 pm Post subject: UP YOUR FASHION! 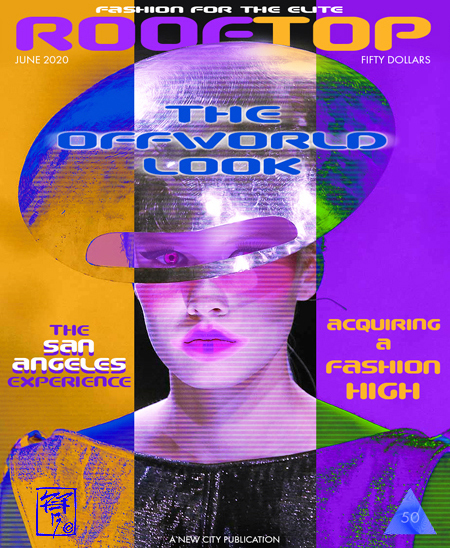 For the high-rise elite, Fashions for OffWorld $$$. Love her hat Great design! I've finally created my first magazine for display in my man cave. After collating BR-esque pics from around the inter web, I decided to display some of my favourites in a soft-bound volume. The result's pleasing and I'm now working on Kill and Horn magazines. I have a full hi-res copy of Whitehall's "Kill" cover but I'm struggling to locate a decent "Horn" cover. At the moment, I've improvised and worked something up as an original design. If anyone has a hi-res version of Horn, please let me know. This will be strictly for my own use only and not for commercial gain. Posted: Tue Nov 01, 2016 12:25 pm Post subject: NICE! I always like to see others tackling these covers! Keeping interest in the original alive. It remains to be seen what we will experience in the new movie - good or bad. 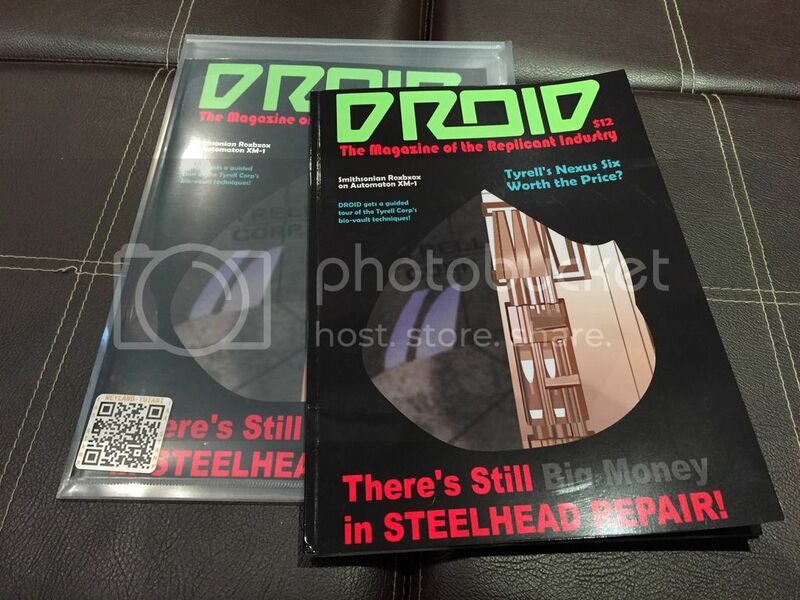 With current tech being what it is, I doubt there will be much, if any, props (magazines) envisioned in paper. I was hopeful from my beginnings here in 2011 that this would be a thread where research and efforts for all BR Paper Props could reside. While much has been discussed and revealed, few have tackled the magazines themselves, understandably. It takes a lot of time and effort to create these - especially since the main reference was so small and limited, for such a long time. While I created my versions of nine, at one point it was suggested there were 11 total. To my knowledge any info (aside from Tom Southwell's kind revelations and his FASH cover) nothing more has surfaced. So no DROID, HORN or KROTCH art. As I recall Tom said another artist did the DROID. Sadly, the origins of that image may never truly be known. So kudos for your work here, DVDC! I look forward to seeing your future efforts. Many thanks. I can't take credit for the cover art, though - that was all Whitehall's talent (part of his digital package). I've just compiled the images, added filters, cut and pasted, etc. I'm spending a lot more time on the next couple of magazines - adding articles, features, etc. I never took mine the full route, concentrating on the covers and later doing ads to fill out the backs. 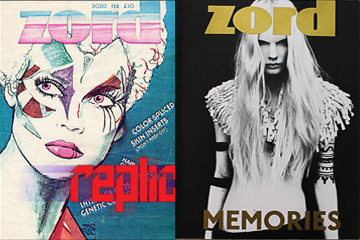 Usually wrapped them around a magazine of the same general size of the original OMNI, for which I had a subscription, back in the 80's, although my FASH is larger, patterned after INTERVIEW and the larger format fashion mags. Then kudos to Whitehall as well. If time permits, I might tackle a redo of the original illustrations done for the actual props back in 1980 - since no high-rez scans seem to have ever surfaced. Currently attempting to contact the creator to see if there are any copies left! Posted: Wed Nov 02, 2016 9:43 am Post subject: FASCINATING! Art imitates life imitates art! Nicely imagined by Arantxa Gisbert and Zalzberg, de Avila and Avellana. Quite an undertaking and excellently done! Noted as published in Spain in 2014! Yes, I was amazed that the zord font has been captured so perfectly. I seem to have spent an age trying to replicate (ouch!) this font - I come close, but no cigar. The content is the icing on this wonderful cake. One day, I'll track one of these magazines down! I would LOVE to get my hands on one as well. . . . . Alas, I am stuck in the States. 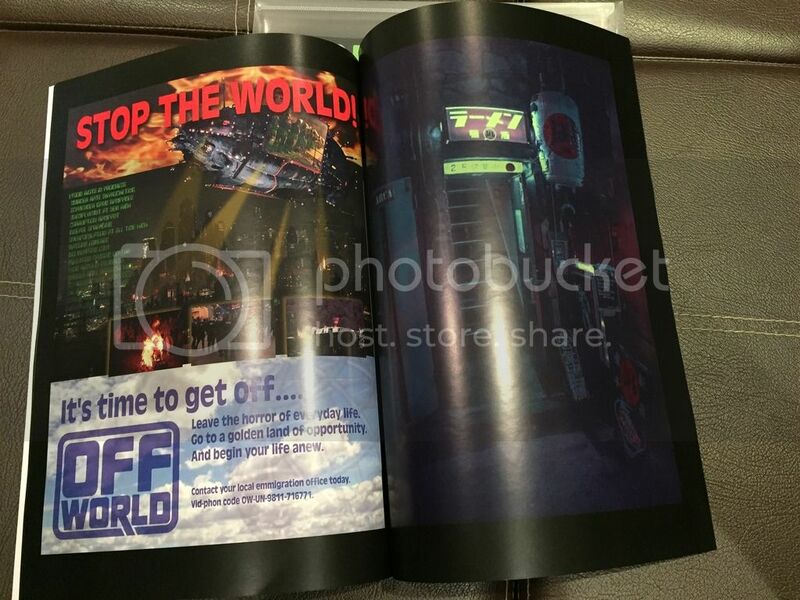 The mag looks so...BR TFS with us DVDC! That's beautiful! Did you use an on-demand print service for it? Planing to put them for sale? I won't be offering these for sale as it wouldn't be right (the images within the magazine, and even the cover, have been produced by far more talented individuals than I, and I don't own the copyright). I've used third party images for this project as I desperately wanted some BR magazines in my collection and I hope I'm treating the creators' work with due respect. With regards printing, I've been using a few online services for BR related projects and I'm still learning the best techniques for collating images, etc. Given the size of this magazine and the quality of the paper, the cost of the "publication" wasn't too onerous. There are a few tweaks I'll make to any future magazines - I'd underestimated space required for internal borders, etc. Having contacted Arantxa, it turns out that the Spanish Zord was a school project! The images had me totally convinced it was a genuine publication. Very impressive work! Thanks for checking further DVDC. I assumed it might be from the text, but did get the impression it was perhaps published. Of course, now, with smaller quantities at low cost run digitally for such uses, it makes sense - as good as it appears, few were probably produced. Too bad. No doubt the files may still exist, but there my be rights issues with the photography.